Game description: Baldur's Gate: Dark Alliance is an action RPG with an epic tale of intrigue, explosive spell effects, and highly detailed creatures and environments. You play a one of three customizable characters, who returns to Baldur's Gate and joins the fight against the darkness that threatens its peace. Take on the monsters solo or with a friend in co-op mode. Baldur's Gate: Dark Alliance is the first game to feature the real time application of the Dungeons & Dragons 3rd Edition rules. 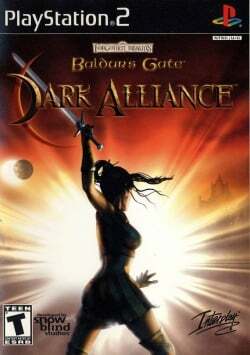 Baldur's Gate: Dark Alliance is the prequel to Baldur's Gate: Dark Alliance II. Status goes from in-game to playable. Runs at a decent speed. You must use a GSdx software renderer and the 4GB patch must be used or game will crash. Can confirm that it works, however experiencing some slowdowns in certain areas where the framerate randomly drops down to 15 - 25 before jumping back up to 60FPS. What causes this appears to be the flames effects in the game (wherever you find torches, fireplaces). Description: Pre-rendered videos (such as the opening logos) are corrupted in hardware mode (PCSX2 1.5.0-20160720115610). Workaround: Go to Config > Emulation Settings > Game Fixes tab, click "Enable manual game fixes", and check "Switch to GSdx software rendering when an FMV plays." However, PCSX2 seems to have trouble detecting when an FMV has stopped playing in this game, so it will likely stay in software mode even during gameplay. Description: Vertical and horizontal lines appear in menus and text boxes when using 2x or higher internal resolution. Workaround: There is no known correct solution, setting the Round Sprite HW hack to "Half" fixes most of it, but it massively reduces the quality of the text/sprites. Use native resolution or switch to software mode. This page was last edited on 16 April 2019, at 06:02.